It was the weekend that Storm Doris had decided to wreck havoc on the UK. 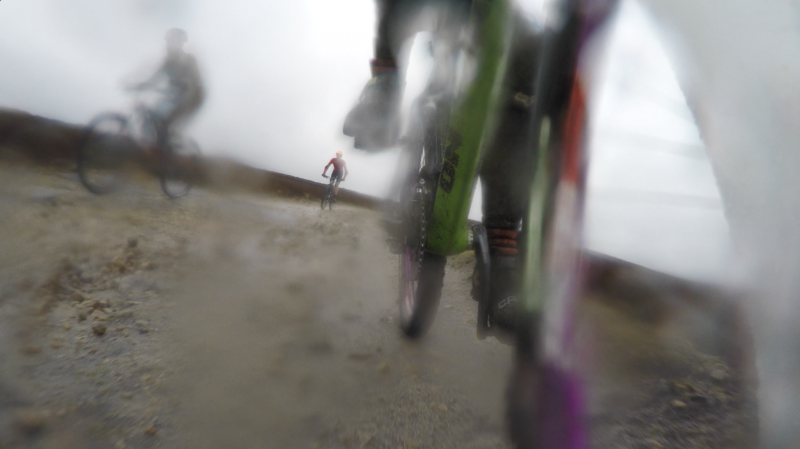 Despite this, we decided to tackle Nidderdale on the mountain bikes – ignoring the stories and photos plastered over Facebook of uprooted trees and the smashed glass of green house windows from home. Having poked our heads out of the window in the early morning the sky looked bright enough to chance a ride. My riding has so far been confined to trail centres, which are ultimately designed to get you around the course with smooth tracks and sweeping berms. To ride in a natural environment would be much more testing and wasn’t anything I had done much of before and so I was really excited to have a go. Pulling up at the arranged meeting spot, a happy smiling face greeted us. This was Neil, our guide for the ride. All four of us, including those who were just starting out on the mountain bikes, were set immediately set at ease as Neil talked us through the plan. We’d been frank with him from the start about the level we were at and it sounded like he’d planned a route accordingly, with no drops or unpleasant surprises. If you’re taking up a trip like this, I feel that it’s important to say it how it is because otherwise you risk endangering not just yourself but others. It allows your guide to pitch the route perfectly to your skill set, ensuring you all have a fun time. Chat flowed easily the whole time we were out and we soon saw why Neil had been getting such good reviews online. I’d never been out with a guide before and so hadn’t the faintest idea of what to expect but he didn’t put us under any pressure to do anything we didn’t want to – or to go any faster. When none of us ride to race it was nice to kick back and really enjoy simply being in the saddle. He sat at the back going at the pace of the slowest person rather than be at the front egging us along – that’s how people get dropped* and that’s not why we were here. We were out simply to explore a new area and enjoy riding our bikes. *learn to love cycling for what it is – a great way to spend some time. It’s not all about getting the fastest time so if you’re with a club that drops you, leaving you on your own while they chase PRs, KOMs or QOMs, it may be time to look for a different club. Doris really did want to pick a fight with us. The wind was crazily strong (you can see me weaving all over the place in the video) and after battling our way up onto one of the highest points on the surrounding moors Neil decided it was best to head back down rather than do the planned loop higher up. This was definitely a good call and we were all glad for it – I was getting blown from one end of the track to the other and was quite incapable of doing anything about it. It definitely must have looked like I’d had a few too many (ignoring the fact it was 10am). 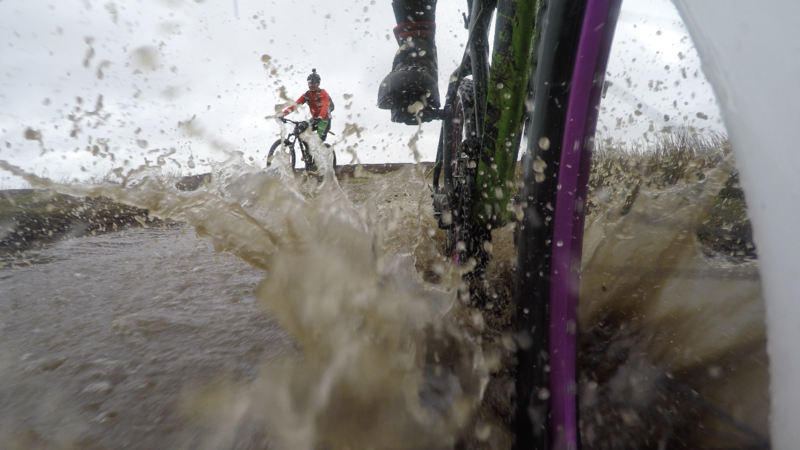 Full waterproofs were 100% needed. Turning around we now had the wind at our backs and that was it – we were away! 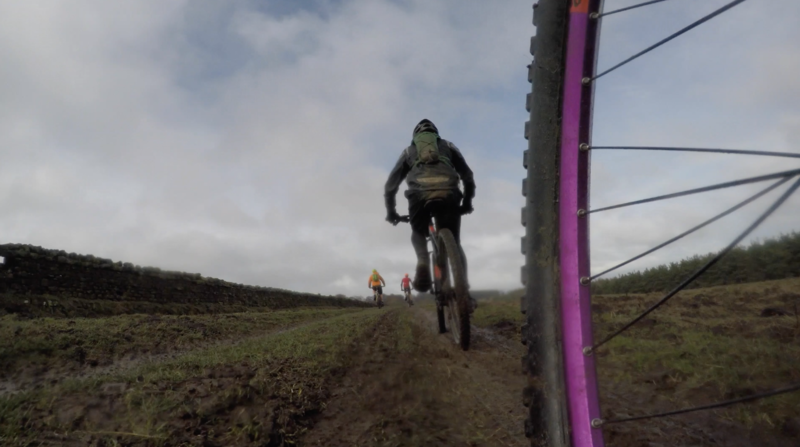 The slog uphill had been worth it for the fun blast back down and I couldn’t resist ploughing through all the puddles – my shoes and socks were wet through anyway so I felt unfazed by the mud and water that was spraying everywhere from five sets of wheels. The downhills were fast with the odd bump for hopping over. It was such a different type of riding to the trail centres I was used to and I absolutely loved it. The unexpected bumps and hopping over gravel and rocks put me on top of the world. 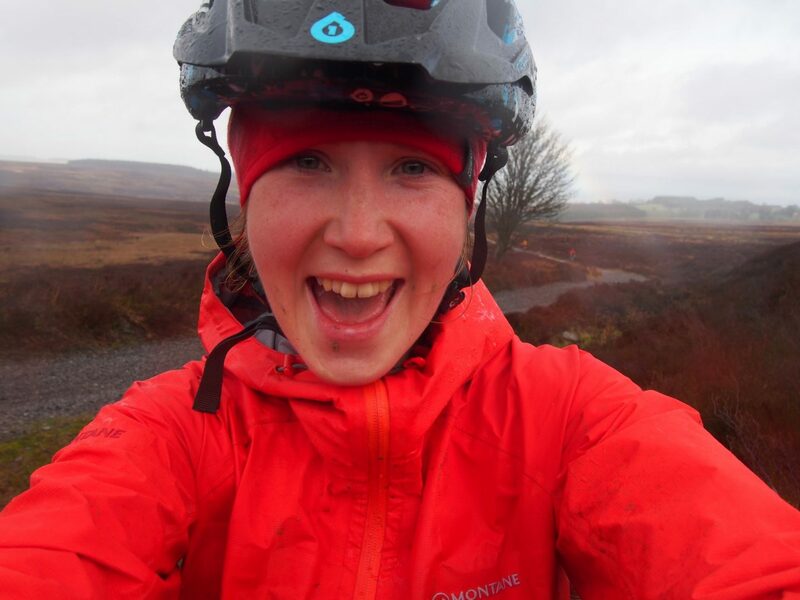 I’m certainly up for going back to explore more of Yorkshire on the bike – it was such a lot of fun, despite the strong winds. 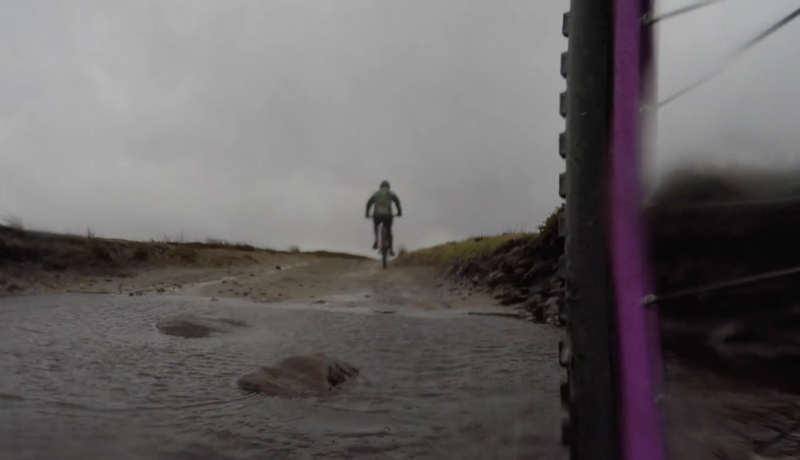 It is worth going and taking a look at some more of Neil’s footage to get more of an idea of what the riding is like on a sunnier day. This downhill (not that the camera makes it look like a downhill) was unbelievably fast and fun. In all honesty, we were really impressed with this ride. 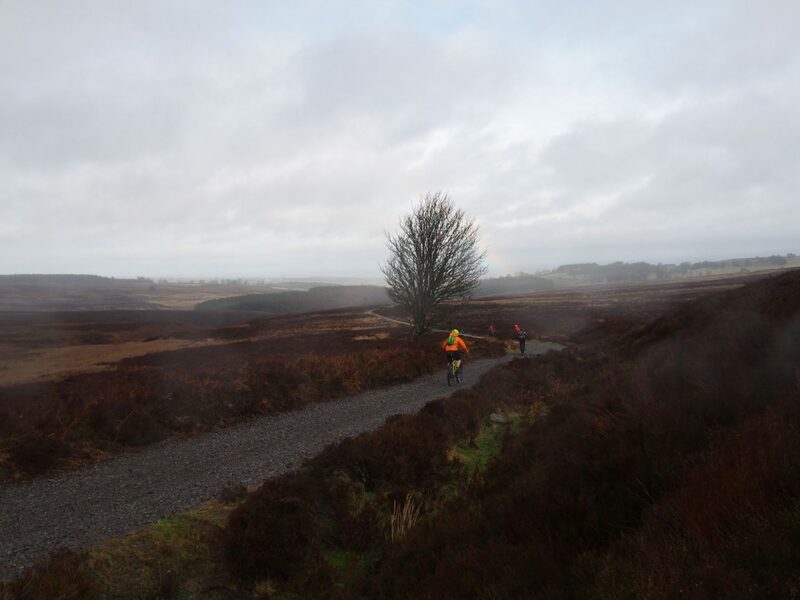 The weather was truly foul but the company was brilliant and the ride was pitched perfectly for us, according to what I had told Neil our capabilities were. He obviously knew the trails really well. There were some mean climbs (which as roadies we love), as well as some whoop-inspiring downhills. We all finished the ride on a high, if a little cold from the wind. 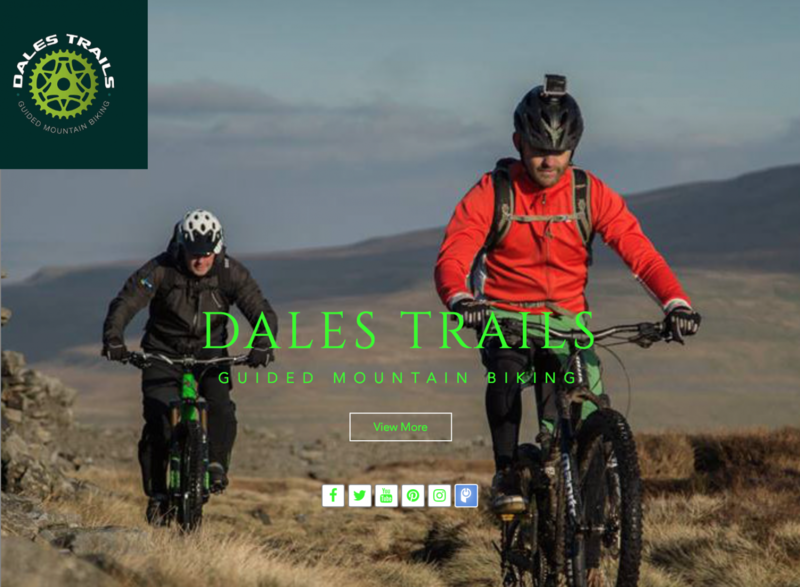 If you’re looking at going biking up to Yorkshire – for a day trip or if you’re wanting to know the area better – definitely take a look at Dale’s Trails.